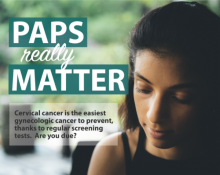 Cervical Health Awareness Month offers us a chance to talk about preventing, treating, and detecting human papillomavirus (HPV) and cervical cancer. About 79 million Americans currently have HPV, and many people with HPV don’t know they have been infected. HPV is a very common infection that spreads through sexual activity, and it causes almost all cases of cervical cancer. Each year, more than 11,000 women are diagnosed with cervical cancer. What can I do to prevent HPV and cervical cancer? Vaccinate early. The good news is that you can prevent HPV by getting vaccinated early. It is recommended that patients are vaccinated at age 11-12, but if you haven’t gotten vaccinated yet there is still time. Patients can be vaccinated through age 26. The HPV shot can prevent HPV and cervical cancer as a result of contracting HPV. Screen regularly. Another method in preventing your risk of cervical cancer is scheduling a screening with your doctor. It is recommended that you start with a Pap test or schedule a Pap test paired with an HPV screening. Scheduling regular screenings can help diagnose cervical cancer early and HPV tests can find any of the high-risk types of HPV that are commonly found in cervical cancer. For more information about scheduling an HPV vaccination or a Pap test, visit our Women’s Health Services page.